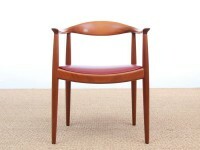 The Danish furniture manufacturer Johannes Hansen produced a number of items of furniture between the 1940s and the 1970s. While there has been no production since then, several pieces have appeared in high-end auctions in recent years; their beauty and rarity have kept prices high. 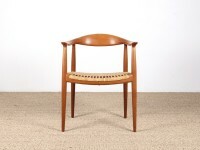 An important part of Johannes Hansen's success has been based on his work with Hans J. Wegner, which began in 1940. In 1941 the first pieces of furniture designed by Wegner were displayed in Johannes Hansen's store in Bredgade 65 in central Copenhagen. 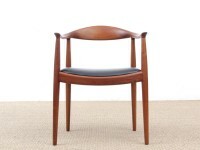 Johannes Hansen was more than twice as old as the 26 year old Wegner but the unique collaboration between the two became the undisputed backbone of Danish furniture design and the main reason for its worldwide recognition in the fifties and sixties. 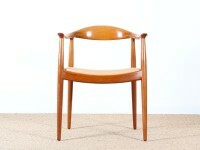 The Copenhagen Museum of Art and Industry acquired the first Wegner chair in 1942. In 1944 Wegner designed the first of a long series of 'chinese' chairs for Johannes Hansen, a series of chairs inspired by portraits of Danish merchants sitting in Ming chairs. Another of his famous designs, the Peacock chair, was first introduced in 1947. 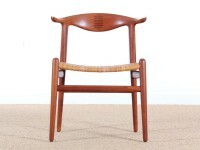 The chair was manufactured for a long time by Johannes Hansen, but was later picked up and resumed by PP Møbler in 1992, after Wegner had upgraded the basic design in the late 1980's. 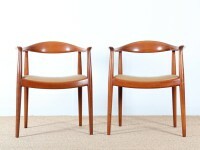 Set of 4 Scandinavian armchairs "The Chair" in solid teak by Hans Wegner. 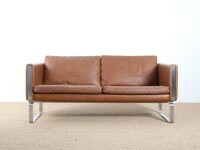 Scandinavian 2-seater sofa. Model JH-802. Pair of Scandinavian chairs "The Chair"